with some FUNctional art glass by Kandyse of Blue Fox Glass. 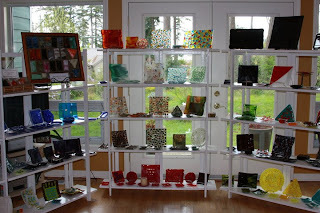 but when she bought a kiln in 2009 fused glass became her new addiction! 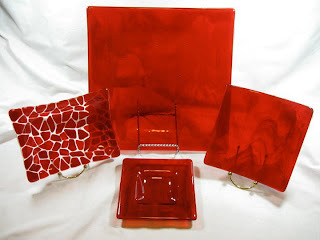 Perfect for your holiday table! Another artisan at this weekends sale will be Tana of PNW Plants. She handcrafts jams from elderberries and other berries, rhubarb, herbs, peppers that she grows in her yard. On occasion she secures organic oranges for marmalade or Yakima produce and Montana Huckleberries to make jams as well. This year in addition to elderberry jam she will have Montana huckleberry/elderberry Syrup bundled with pancake mix and a spatula. Her infused olive oils are organic and infused with herbs from her yard. She will also have 5 freshly potted indoor Hoya Plants. Her items sold out quickly last year so come early if you want these! Every year I do 2-3 shows out of my home as a special treat for those on my email list. My annual holiday show and sale is fast approaching! On Dec 3 & 4 at my home in Southworth shoppers will find Beadware's jewelry and gifts, beautiful fused glassware by Blue Fox Glass, and herbed olive oils and homemade jams of PNW Plants as well as music by Past Tunes and a hands-on basketry demo. Each day this week I will profile one of the artistisans. Sunday will feature a hands-on basketry demo by Jo and George Hart of Wilderness Basketry. Jo grew up in the Appalachian Mountains of Kentucky, near Berea. She has 2 passions in life, plants and basketry. She has studied with many Native American master basket weavers from the Pacific Northwest plus local basket artists as well as a noted Applachian white oak basket maker. She has been a member of the Seattle Vi Phillips Basketry Guild for many years and has taught in Washington and Oregon. Her work has been displayed in the Kitsap County Indian Museum, local libraries, local and state fairs, and in Washington galleries. Recently, she was featured in a basketry article in the Westsound Home and Garden Magazine. Her husband, George, grew up in the Blue Ridge Mountains of Virginia. He is a wildlife biologist by trade and has devoted many years to the gathering, harvesting, and preparation of natural materials. He has also studied with Native American and local artists. He uses cedar bark, cedar and spruce roots, and local grasses and sedges in his baskets. His prefered technique is coiling. On their website you can see last years class schedule. They teach in their studio located in Seabeck.You'll also be treated to a view of their amazing gardens! 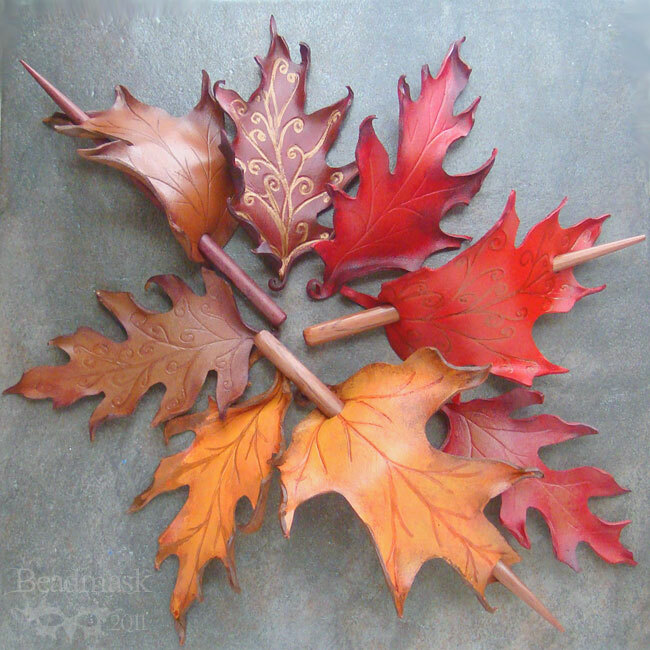 Come learn from these skilled experts how to make your own cedar ornament. Demos will start Sunday at 1pm. Old Town Custom Framing and Gallery in Silverdale. 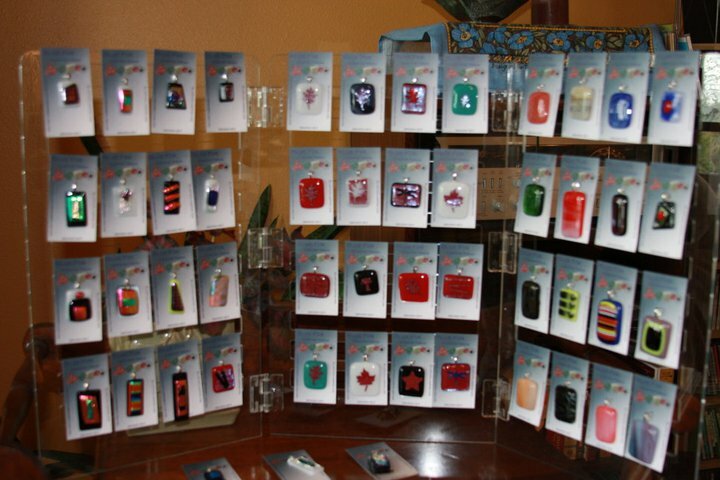 Here you will find a variety of beautiful artisan crafted items. Paintings, photos, clothes, jewelry (including Beadware) and pottery. And if you need something framed, Maria the owner does a fantastic job of that. Another option is Juliana - It's a great little store. This boutique is located on Piperberry, near the intersection of Bethel and Sedgewick. 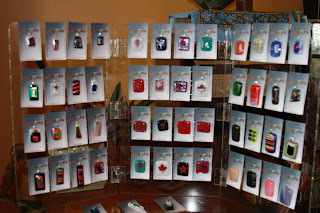 In addition to Beadware, you will find a variety of locally made items. A few new things so far this week. The necklaces all have an ocean jasper pendant. The second and third ones sold the following weekend. Things go quickly during the holidays! Good for me, but not so good if you wanted one. I will be making more and will post pictures here. And a custom order for gold bangles. This past weekend I had a booth at the Bremerton Food and Gift Show. It is fun to wander and see what other artsy things are there.Being a gardener I loved this booth. They are created by using a hammer to make a print of the plant onto cloth. The resulting piece is then scanned into the computer and a digital image is created to preserve the vibrant colors. The artist uses plants from her own garden near Wallingford in Seattle. Doesn't this look like a lovely place to work? Go to her website Pederson's Garden Poundings to see the variety of cards and prints that are available. This fall I received a gift of a whole box of old chandelier crystals. Thanks Brenda! Some very interesting shapes and a few were huge. Now what to do with them. The purple one is a special request. I created a short beaded figure eight loop in either silver or gold to hang them from. Then I added ribbon and a hanger. It is cold and rainy out today so I have all day to create these sparking beauties. You can see them in person this weekend at the Bremerton Food and Gift Show. Imagine how nice they'd look on your tree! I sold this new necklace and the longer earrings on Saturday. It used copper links and a copper clasp with fall toned glass seed beads and copper accents. The pendant stone is green opal. From the customer I learned that the green opal is the matrix that surrounds raw opals. She pointed out the green flecks of shiny opal running through the stone. So nice to know that the necklace went to someone who knew what it was and who really appreciates the stone.I have several more of these beauties to turn into new treasures. I was also invited to go to a meeting of a local gem and mineral club. I could really use more education on the stones I work with. I just might have to check out this group. A fellow artisan, Andrea of Beadmask, has a great post on her blog about why buy handmade this season....."One reason that I am so passionate about this is that your purchase from a big box store is really just a drop in the bucket of their profit margin; while your support of an independent artist actually has a powerful impact on the life of an individual! Buying handmade also benefits you and your intended recipient, in that you're choosing to give something unique -- which (at least in my book) is wonderful and special." Read the whole post at on her blog. Last weekend one of my neighbors at the North Kitsap Holiday Fest was Corena Chamberlain who makes luminaries and paper sculptures. She uses recycled and handmade papers, wax and natural treasures. I fell in love with the snowmen! The arms are real sticks, the noses are clay. Each one is individually sculpted and have their own personality! Don't they just make you smile!!? You can hang them from your tree. An opening in the back allows you to put a light inside so they will glow. You can find some of her items online . You will also find Corena's Creations (as well as Beadware) Nov 18-20 at the Bremerton Food and Gift show at the Kitsap Fairgrounds. These new necklaces all use autumn hues of ambers, browns, golds and reds. A picture jasper pendant with black and hex cut satin gold glass seed beads. A delicate gold and pearlized glass seed beads necklace with a jasper pendant. Two strands of hex cut satin gold glass seed beads with an agate pendant. A beautiful green opal pendant with copper links and glass seed beads. Another picture jasper pendant with satin brown and amber glass seed beads. This past weekend I had a booth at Holly Daze in Port Orchard. I shared a "store" with Blue Fox Glass and A Wee Bit. beautiful handcrafted leather and sewn goods. John's leather cuffs use cowhide and stingray, dyed, hand stamped and decorated with silver and stones. And a new addition is a holder for electronic readers like Kindles. All their items would make excellent holiday gifts. You can find them, as well as Blue Fox Glass and Beadware at this coming weekend's North Kitsap Holiday Fest in Poulsbo and the Nov 18-20th Food & Gift Fair at the Kitsap Fairgrounds.